With the mantra "reduce, reuse, recycle" on everyone's mind, reusing an old sweater by recycling it into wool dryer balls will reduce the need to purchase dryer sheets. With old sweaters lying around, there is no need to purchase new wool for this project. Use an adult-sized large sweater to make at least three wool dryer balls from one sweater. Lay out the clean and dry sweater on a flat surface. Cut a 3-inch square out of one layer of the sweater. Ball up the square in your hand, pressing it as tightly together as you can. Wrap a scrap of yarn around the ball at least 10 times. Secure the end by tying or pulling through the ball using the crochet hook. The square should remain in a ball after cycling through the washing machine. Wrap it with more yarn if you feel it is needed to stay secure. Place the sweater ball into the leg of an old pair of pantyhose, and tie a knot in the pantyhose to secure the sweater ball. Cut off the excess pantyhose. Set the washing machine on hot, and run the sweater ball through an entire wash cycle. Remove from the washing machine, and run through the dryer for a complete cycle. Remove from the dryer. Remove the sweater ball from the peg of the pantyhose. It should have started to felt. 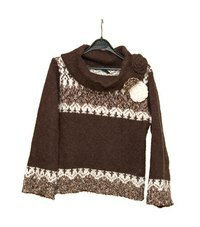 When it is properly felted, you will not be able to see the individual crochet or knitted stitches in the sweater ball. It will look very similar to a piece of felt you purchase from a store. You can repeat Steps 3 and 4 again if you prefer it more felted. Cut a 7-inch square out of a single layer of the sweater. Wrap the square around the felted ball. Secure by wrapping with the yarn scraps again, and secure the end by tying or pulling through the felted ball with the crochet hook. Repeat Steps 3, 4 and 5. If you are satisfied with the size of the wool dryer ball, you are finished. If not, go to Step 7. Cut an 11-inch square out of a single layer of the sweater if you prefer a bigger wool dryer ball. Wrap the square around the felted ball, and secure by wrapping with the yarn scraps. Secure the end by tying or pulling through the felted ball with the crochet hook. Repeat Steps 3, 4 and 5.